HR 8799 is a popular system for astronomers interested in exoplanets. It was the first system in which an exoplanet was detected with direct imaging*, and in fact, three exoplanets in HR 8799 were found at the same time! (The planets are labeled with the name of the star and lower-case letters, starting with ‘b’.) A fourth planet, HR 8799e, orbiting closer to the star, was imaged more recently. This plethora of large, bright planets makes HR 8799 a great laboratory for studying exoplanet atmospheres. However, measuring the spectra of the planets’ atmospheres is tough, because they are extremely dim compared to their star. The previous spectral observations we do have seem to indicate a strange lack of methane (CH4) in the atmospheres of planets b, c, and d, which may be due to heating caused by thick clouds. Also, atmospheric models have trouble predicting realistic planet radii based on the near-infrared observations. 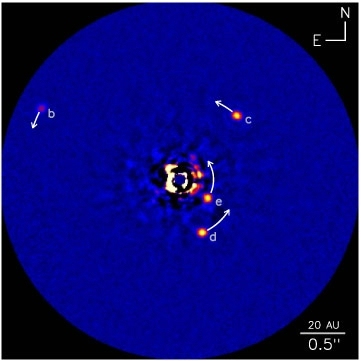 So when the authors of this paper wanted to test the new Gemini Planet Imager (GPI), built on the Gemini South Telescope in Chile, they decided to tackle the challenge of observing the spectra of HR 8799c and d. GPI is an integrated field spectrograph (IFS), which means it can take a spectrum of each pixel in an image. This allowed the authors to measure the spectra of planets c and d separately (planet b was outside their field-of-view and planet e was too close to the bright star). Despite the poor observing conditions on the first night of observations, the spectra of the planets had a moderately good signal-to-noise. The authors found good agreement between their spectrum for planet c and the spectrum previously obtained by Konopacky et al. (2013). They also noticed that the spectrum for planet d has a different shape than planet c’s spectrum, indicating that planets d and c are not as similar (in mass, temperature, etc) than previously thought. Fig 2: Comparison of model spectra with data for planets c and d. The different data sets are shown in green, red, and blue (which indicates the GPI data). The best atmospheric cloud model is shown in black. The best model fit with a varying planet radius is shown in magenta. The authors added their new spectral data to previously-measured spectra and attempted to reproduce all the data with atmospheric modeling. Unfortunately, no single atmospheric model fits all the data. The modelling challenge is to include enough clouds to warm the atmosphere and keep the methane levels sufficiently low to match our observations, without being so thick that they block the emission we see from lower layers of the atmosphere. The authors realized that for both planets, if they used a planet radius based on evolutionary models, they could not fit the observed spectrum. If instead they allowed the radius to vary as a parameter of the model, they could fit the spectrum much better. However, the radius predicted for each planet with this technique was too small, based on what we know about planet formation and evolution. The authors point out that this radius problem could be solved if each planet had a massive core surrounded by an envelope of hydrogen and helium, but they believe this scenario would require unrealistically massive cores. Instead, the authors suggest that we just need better models that can handle the complex chemistry and heat transfer in these atmospheres. Theorists (including myself) often complain jokingly that data only ruins our perfectly nice models. Hopefully the exciting new Gemini Planet Imager will be smashing our predictions for years to come, forcing us to develop newer and better models to explain all the weird new exoplanet atmospheres GPI will observe. *Although direct observations of Fomalhaut b were announced the same day! Searching for Life via Exoplanet Smog And the Saga Continues: The Story of Exoplanet WASP-12b An update on the atmosphere of super-Earth GJ1214b Habitability Whether Rocks Weather or Not?